The six-astronaut crew of space shuttle Discovery's finalmission arrived at NASA's Florida spaceport yesterday (Oct. 12) for severaldays of training, including a complete dress rehearsal for their upcominglaunch. The astronauts will spend the next few days at NASA's KennedySpace Center in Cape Canaveral to prepare for the lastlaunch of Discovery on Nov. 1. "It's really exciting to be down here, we haven't doneone of these in nearly six months," said Discovery commander SteveLindsey. "It's good to be back here with the Kennedy Space Center team andget an opportunity to work with them again. Our training is pretty much done,for the most part. We're ready to fly. Just a few more weeks of things for usto do and we'll be ready to go." The crew is slated to launch on an 11-day mission to the InternationalSpace Station. On its final spaceflight, spaceshuttle Discovery will take important spare parts to the space station,including a storage room and a humanoid robot helper to assist the crew of theorbiting outpost. 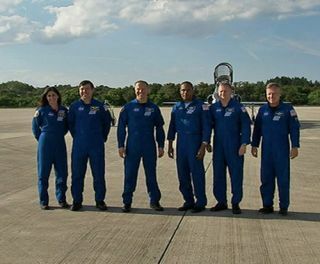 Lindsey and his crewmembers, pilot Eric Boe, and missionspecialists Michael Barratt, Nicole Stott, Alvin Drew and Tim Kopra, flew toKennedy from NASA's Johnson Space Center in Houston aboard the space agency'sT-38 jets. The white, supersonic aircraft are used by astronauts to maintaintheir aerial skills between missions.